Sonic sculptural installation. Collaboration with Daniel Nash. Like 60’s sci-fi series The Prisoner, strange spheroid shapes are appearing on the surface of the development site. This absurd invasion is part of the Art at the Centre public art programme for 2009. 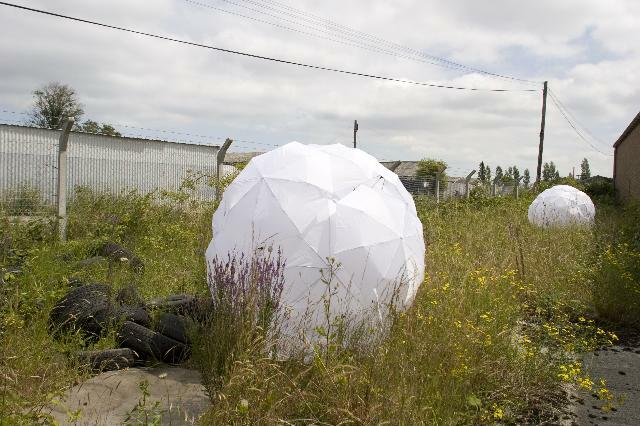 Working with Queenborough School pupils and local sound artists, sounds were collected from the surrounding industrial and natural environment emanated from these umbrella sculptures.